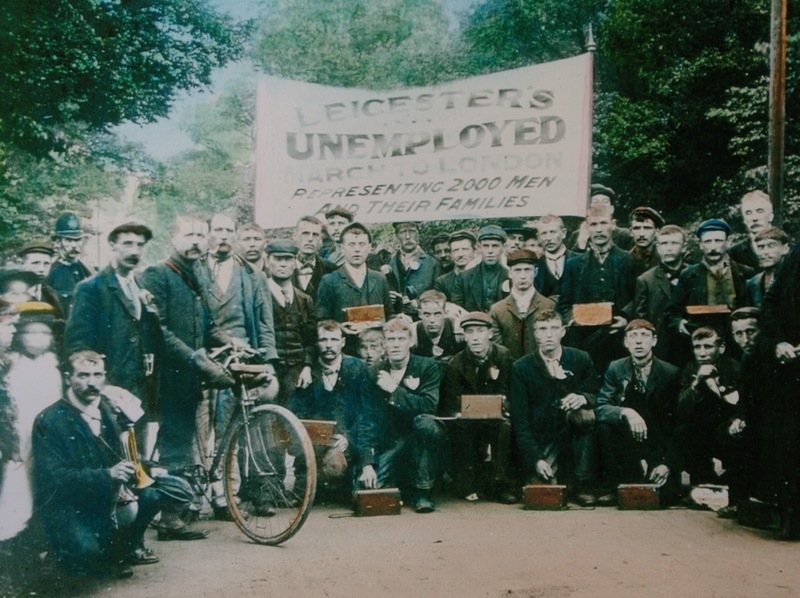 On 4 June 1905, 497 unemployed men from the city of Leicester marched to London to protest against the lack of employment opportunities. A plaque to commemorate this event is located on the floor of the Market Place, in front of the Corn Exchange steps. 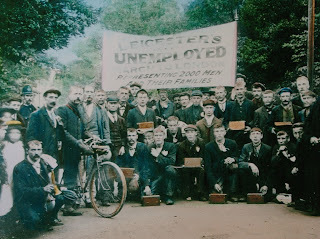 Although scarcely mentioned in the history books, the 1905 march to London of the Leicester unemployed was one of the most momentous events in the history of the city's working class. It was a six-day, 100-mile march with the goal of meeting King Edward VII or if not the Home Secretary or the Archbishop of Canterbury. All they wanted was answers and the promise that conditions would improve. They really needed to improve as well. Unemployment was huge at 15% and had been further fuelled by the ending of Boer War. Leicester was famous for its hosiery and shoe manufacturing and with factories working to full capacity to make boots for the soldiers during the war, when it ended people were laid off while remaining staff were given shorter hours. In those days there was no money to collect from the state for the unemployed and if you didn’t have family or friends to lend a hand – you starved. Life in the slums of Leicester was at an all-time low so the people decided to make their voices heard. 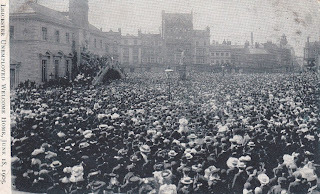 On the morning of June 4, 1905, some 30,000 people gathered at Leicester Market Place to show their support to the 497 men who decided to march. The men wore heavy hobnail boots, looked rather dirty and were, obviously, very poor. From Leicester to Market Harborough, through Northampton, Luton and St. Albans – they arrived at London, sleeping in old churches and cattle sheds along the way. It would be nice to think that all 497 men completed the journey but the total that reached the capital was only 437. Bad weather, fatigue, injury and exhaustion had whittled the numbers down. The marchers arrived in London on the Friday evening and arranged to meet in Hyde Park the following day. Their plans were scuppered by stormy weather and they ended up being split into two groups. The larger group never made it to Hyde Park and only 120 men turned up. Local London well-wishers were also at a minimum due to the weather. It was a sad end to wonderfully proactive march with a purpose, and to make matters worse, the king refused a meeting. On Sunday June 11, when all hope was lost, prayers were said in honour of the marchers in Westminster Abbey and, without a great deal of hope, a hasty gathering in Trafalgar Square was attempted. This time there was some success. A crowd of 50,000 working class Londoners arrived to honour the Leicester marchers. Although the journey didn’t get the results they wanted, the Londoners did turn out to support the Leicester men in the end – when the weather died down of course. 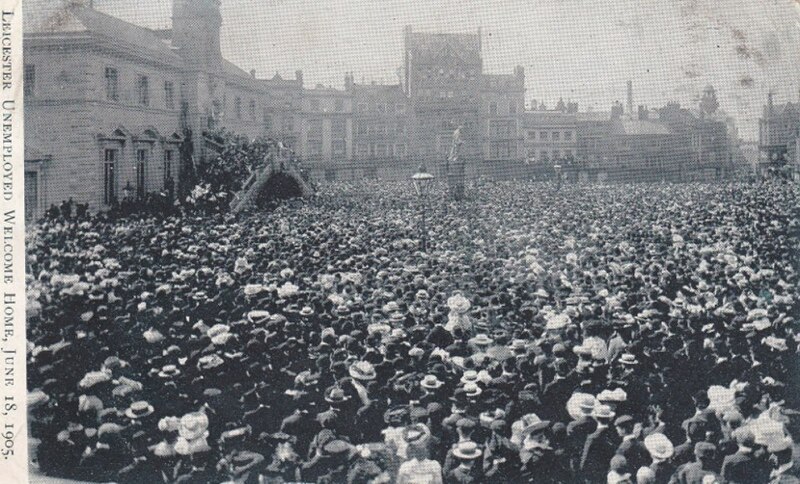 The long walk home now didn’t feel as bad and although it took another seven days they were greeted by Leicester-folk as heroes with tens of thousands of people once again gathered in Leicester Market Place. The gathered crowd at Leicester Market Place to welcome home the marchers. The leaders of the march all gained the respect of Leicester citizens and, as a result, two of the three went on to be hugely successful. 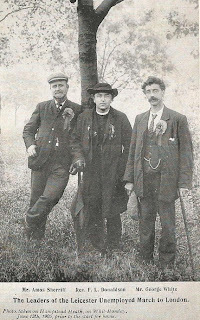 Amos Sherriff would become Mayor of Leicester in 1922 and the Reverend F.L. Donaldson, vicar of St Mark's Church, became a Canon of Westminster Abbey. The other march-leader was George ‘Sticky’ White, secretary of the Unemployed Committee, called 'Sticky' because he walked everywhere with a stick. Despite his disability, he walked all the way to London with the others but for reason unknown he only received little fanfare when he returned to Leicester. He sadly committed suicide in the 1920s. In the same year that Amos Sherriff became Mayor of Leicester, Liberal leader David Lloyd George became Prime Minister and laid the foundations of the welfare state, including unemployment insurance. I am sure that the Leicester march was successful in raising awareness for the cause and at that time it was the most impressive march to have ever taken place in England. Thirty years later the Jarrow marchers acknowledged the influence of their Leicester forebears. The march was a remarkable humanitarian effort by ordinary Leicester people who were successful in raising public awareness of the plight of the working class, paving the way for change and sowing the seed of the welfare state.